If you don’t know anything about ozone or ozone generators, you might be looking for ways on how to build an ozone generator. An ozone generator removes odors, so it's a useful tool. There are also ways to build an ozone generator at home, of course. It’s extremely complicated, though. Even looking for how to build an ozone generator for hunting or how to build a cold plasma ozone generator can be complicated! The bottom line is that you shouldn’t opt to try to create one yourself. Making an ozone generator at home may be cheap, but a lot of things can go wrong. While ozone generators can be pretty expensive, it’s not a good idea to just bypass that and make your own. 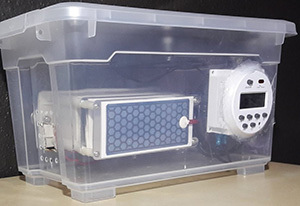 It might seem like a good idea and it might be cheaper, but a lot of things can go wrong if you try to build your own ozone generator at home. Whenever it comes to ozone, there must be electrical charges involved. Because of the electricity, you can easily get shocked from it. Not only does it become dangerous through electricity, it is also a fire hazard. On top of that, ozone is dangerous enough as is. The thing with ozone generators is that you have to leave them on for hours at a time, usually. If you have not followed electrical codes or fire safety, you could see a dangerous fire starting around your homemade ozone generator. There are many reasons why ozone is dangerous, but the main reason is that it is highly reactive toward organic material. “Organic” is another way of saying “living”, of course. This means that it affects humans, animals, plants, and microbes. Ozone is composed of charged molecules with oxygen atoms, containing three of them instead of two. Because of this electric charge, ozone molecules will try to get rid of that unstable third atom. Whenever it interacts with organic material, it will shove itself along the cells and have it attach to those cells. This damages the cell itself and can cause a lot of problems for anyone or anything that breathes it in. For humans and animals, it will cause lungs to become inflamed and respiratory systems to get damaged. Plants will wilt and die if exposed to ozone. This is why you should never breathe in ozone, concentrated or otherwise. People with lung diseases will also have a harder time with it. Make sure you run an ozone generator in an unoccupied area. Take all pets, plants, and other people from the room if you decide to use one. However, this should only be done with a retail-manufactured ozone generator. Making one yourself is not recommended, but there are plenty of ways to use an ozone generator safely. 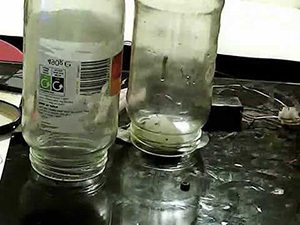 There are many dangers that come with making a homemade ozone generator. Ozone generators are not terribly expensive. If you’re very concerned about an odor or killing mold and other microbes, you should buy one. Professionals are also an option when it comes to these things. If you’re thinking about making an ozone generator yourself, consider the dangers. The main thing that you have to worry about with homemade ozone generators is that a hard spark has to be created. This hard spark will cause oxygen molecules to become charged to gain that extra oxygen atom. High voltage is required to make this hard spark, so if not contained properly, it can easily start a fire. This is especially true since you have to leave it running for 3-6 hours at a time. Along with a fire hazards, there is the actual construction. There are specific materials that are needed to create an ozone generator. For example, you need Plexiglas, corona plates, cathode kits, microchips, and more. You also need things to transfer electricity, like wires, batteries, or a transformer, to actually produce hard sparks to create the ozone. There’s a lot of science behind it and it simply isn’t worth your time. May not cover the entire room. Whenever you’re looking for an ozone generator, you have to take into consideration the size of the room you’re going to use it in. There are different amounts of ozone they can produce and bigger rooms need more powerful generators. A homemade ozone generator will likely not produce enough ozone to cover an entire room. This means that an odor or microbe that you want to kill will survive the expelled ozone. Ozone generators are one of the best things that you can use to remove odors and help with mold and pests. It won’t replace a professional, but it will help in the long run. You may think that you can make one at home, but they are a lot more dangerous than a regular ozone generator. Not only are they extremely difficult to make, but they can also cause fires and they may not be as effective as you’re hoping they are. If you’re looking to remove odors from a room, just buy an ozone generator. Ozone is dangerous enough as it is, so you don’t want to add additional hazards to the operation. There are many options out there when it comes to ozone generators. If you don’t want to buy one or hire a professional, you can always rent an ozone generator, too. There are many options out there, so don’t resort to a dangerous homemade generator to get rid of those pesky odors!